Dmitry Korkin stands before a depiction of a network of proteins that are affected by type 2 diabetes (in pink). The lines represent protein-protein interactions that are expected to be affected by the mutations that are linked to types 2 diabetes. The tools Korkin and his team are developing reflect a new way of looking at the molecular machinery of diseases, he said. It is now known that many complex diseases are associated with dozens or even hundreds of mutations. Each of these mutations will produce a protein that is different from the one that the normal, non-mutated gene codes for. An emerging model in biology contends that focusing on the interactions between these altered proteins (biologists refer to these interactions as “edges” in the protein network) yields a far more accurate picture of how mutations translate into changes in cellular functions, and will, therefore, provide a better picture of the way in which diseases begin and progress than looking at the mutations alone. 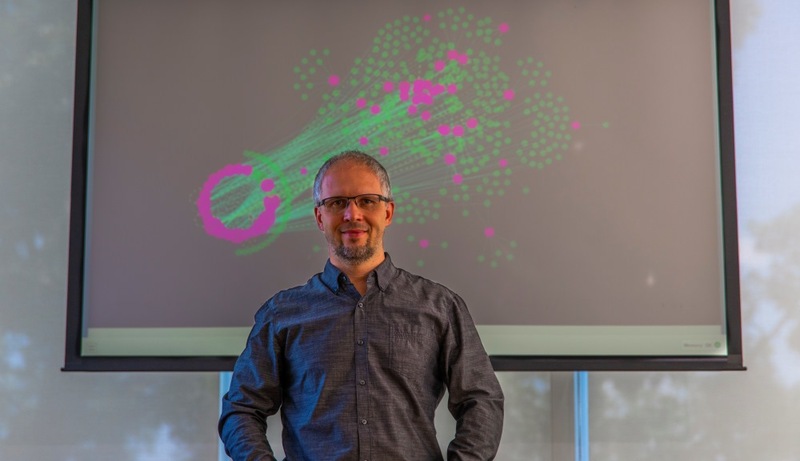 In a recent paper in the Journal of Molecular Biology (“Multilayer View of Pathogenic SNVs in Human Interactome through In Silico Edgetic Profiling”), Korkin and his research team describe the first machine learning tools capable of modeling those protein interactions en masse and building a profile of a cell’s edgotype. As a case study, the team used the tools to trace the connections between the dozens of genes that are linked to type-2 diabetes and the actual cellular damage that produces the disease’s symptoms. They looked systematically at the interactions between the proteins produced by the normal versions of those genes, and then looked to see how those interactions change when the proteins come from mutated genes. The analysis provided a first-of-its kind look at how the mutations ultimately translate to alterations in the way cells and tissues function.